Froggy's Fiber Followings: What's Next? 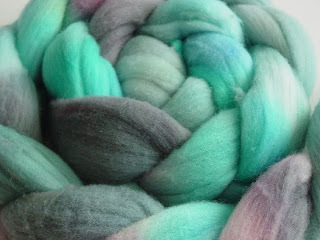 This is what I have up next on the spinning block. It will be a two ply like the last one but I am hoping to spin the single a little thicker so that my 2ply is a little bigger too. Right now I'm probably getting a sportweight but thats pretty unofficial since I haven't measured it. (It's so unofficial that I am not even sure that is the right term and I don't feel like google-ing it.) I'll just correct myself in a later post.